Domaine Servin’s 35 hectares of vineyards are situated within the boundaries of the village of Chablis, lying solely on Kimmeridgian limestone soils, which gives the wines their incomparable minerality. The majority of the vineyards are over 40 years old. The different rootstocks of these non-cloned Chardonnay plants produce a unique style of Chablis, combining concentrated flavours and intense aromas. Our guarantee of excellence. The Vaillons shows the classic Chablis style with dry mineral aromas. 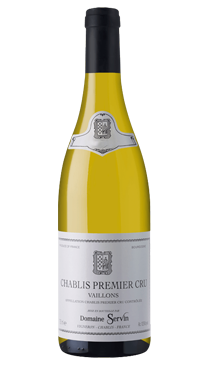 Vivid and intense, the vibrant energy is blended with ripe white fruit aromas. Excellent acidity adds the complexity and makes a wine that is known for its ageing qualities. The wine is made from the following vineyards “Châtains”, “Côte Vaillons”, “Epinottes”, “Les Roncières” and “Sécher”.